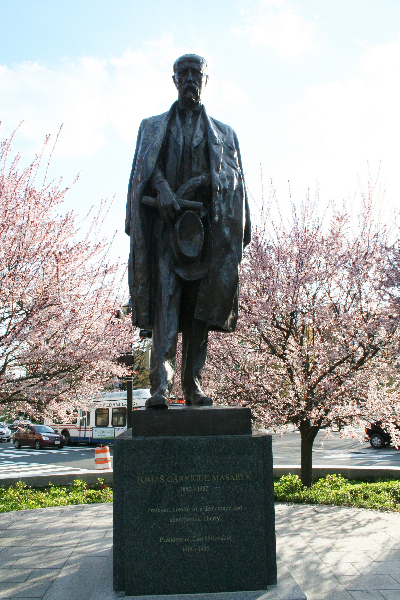 The Masaryk statue was a gift to the United States from the Czech Republic. The idea of having a statue of a Czech citizen in Washington, D.C. was championed by The American Friends of the Czech Republic (AFoCR) in 1999. The group became aware of a statue of Masaryk sculpted just before his death in 1937 by Czech sculptor Vincenc Makovsky. The sculpture had been stored for safekeeping during the Nazi invasion and the Soviet occupation. Once the sculpture was found, AFoCR lobbied Congress to accept the gift and a bill to accept the statue of Masaryk was passed on November 5, 2001. The design concept for the Masaryk Memorial was approved in June 2002 and the final design approved in July 2002. And in September 2002, the statue of Masaryk was placed in the new T. G. Masaryk Park in Washington, D.C.
Masaryk’s great-granddaughter, Charlotta Kotik, unveiled the statue. It was dedicated by Czech President Vaclav Havel, U.S. Ambassador Craig Stapleton and former U.S. Secretary of State Madeleine K. Albright. A large crowd attended the ceremony and the U.S. Navy Band played the three national anthems. The stone plaza, landscaping and placement of a descriptive plaque were completed in 2004. The 12-foot statue shows Masaryk with a hat in one hand and the Declaration of Czech Independence from Austria in the other. In 1918, Masaryk, along with Edvard Beneš, founded Czechoslovakia. Masaryk modeled the Czechoslovak Declaration of Independence closely on the U.S. Declaration. President Woodrow Wilson who had advocated for all countries to be free and democratic after World War I, recognized Masaryk’s exile government as the de facto government of Czechoslovakia on Sept. 3, 1918. Masaryk’s personal relationships with many Americans most notably President Woodrow Wilson, led to the recognition by the United States of a free Czechoslovakia in 1918. For six months Masaryk traveled throughout the United States writing the Joint Declaration of Independence from Austria that was signed in Philadelphia and issued in Washington on October 18, 1918, where he was declared the President of Czechoslovakia. Masaryk, the son of a coachman and a cook, became a philosophy professor. He fought anti-Semitism and advocated women’s rights, even taking the family name of his American-born wife, Charlotte Garrigue, as his middle name. A Hero of Democracy Finds a Home; D.C. Park Location Approved for Stored Statue of Czechoslovakia’s Founder. The Washington Post Company Mar 22, 2002. Checks for Czechs and a Farewell to Havel: The Washington Post [Washington, D.C] 23 Sep 2002: C03. Metro; In Brief: [FINAL Edition] The Washington Post [Washington, D.C] 08 Mar 2003: B03. Thank you for your article concerning the great personality of the first President of Czechoslovakia, Tomáš Garrigue Masaryk. I have one remark conserning the sentence: “In 1918, Masaryk , along with Eduard Bene, founded Czechoslovakia.” There is one mistake. The correct name should be “Edvard Beneš”. Mr. Edvard Beneš was the collaborator of T. G. Masaryk, his friend, and the second President of Czechoslovakia (1935-1948). He was the leader of Czechoslovakia during the fight against Germany during in 1939-1945. He stayed in London in this time, with the Czechoslovak government. Thank you for your email. And thank you for the clarification, I have updated the post with his correct name. I also appreciate learning a bit more about Mr. Beneš. Next Next post: Play Ball!